This weekend was infrastructure improvement time on the Aquia Line. With help from Alicia, I began repainting the common areas of the basement and ordered new carpet for the stairs. This was a task that I have planned for quite some time, but I finally decided to get it done. 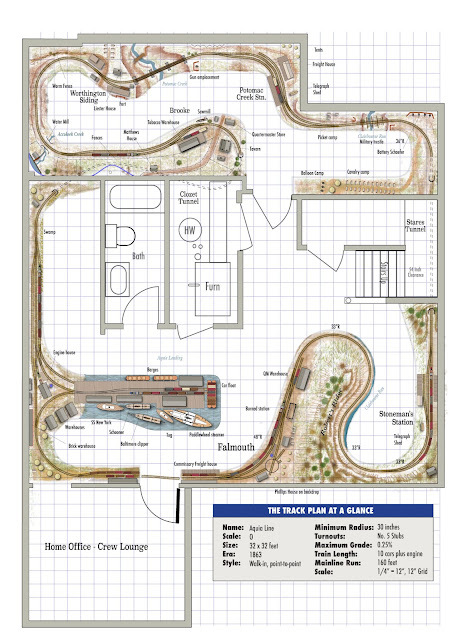 To take a break from the painting work, I worked on the track plan for expanding the Aquia Line into the crew lounge. This plan is similar to the previous plan, but I angled the peninsula. The opens up the central aisle a bit and puts Falmouth on less of a curve. The trade off was to make the benchwork by the new Stoneman's Station narrower. There is also a slight choke point at the top of the Roberts Ridge peninsula, but that is not an active area for operations, so it shouldn't be a problem (so that's where everyone will congregate if Murphy is around). I also showed a possible continuous run connection. I did some line of sight testing in the room. With this design (and the previous too) an operator in the pit near Stoneman's Station cannot see Potomac Creek Station. So there will be a TT&TO pucker factor as crews move from Potomac Creek to Stonemans and vice versa. That's a good thing as it "lengthens the run." I like this plan. It provides a good poit to point run and a continious connection when visitors show up.